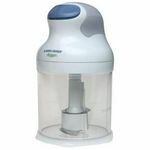 14-cup work bowl; extra large feed tube; chopping/mixing blade, dough blade; detachable disc stem|Speed up your cooking process with this easy-to-use food processor that features a 14-cup work bowl, a mixing/chopping blade and a dough blade for cutting through various foods with ease. The extra large feed tube holds whole fruits and vegetables. Beam me up & feel my awsome weight!! Gets the Job Done!! This machine is powerful enough to handle any kitchen job you may have. Power I find that this food processor has plenty of power to make anything from Fruit Sorbet to Almond Butter. I like to buy frozen peaches or berries, and run them through the machine to make a fruit snow then add just a bit of agave and/or juice to make it into the proper texture, similar to ice cream or sorbet. It is healthy and delicious. I also make my own almond butter by putting a pound of almonds into the food processor and turning it on, scraping down the sides occasionally. It comes out great. You can make Pecan Butter, too! Safety This food processor has excellent safety features. If you don't have the top locked onto it properly, it will not turn on. Ease of Assembly It is very easy to assemble as a food processor or as a grater/slicer. Very easy to use. Ease of Cleaning You just take it off the machine and disassemble the parts and wash them. They are easy to clean and the main food bowl is virtually indestructible. The main thing is to clean it as soon as you finish using it, and it will practically rinse clean, but of course you'll have to use detergent if you chopped onions, garlic, or oily things. Durability As I mentioned before the food bowl and top are virtually indestructible. The blades are very strong. I have used them repeatedly on frozen fruits and berries and nuts and they still work perfectly well. I got this as a gift about 5 years ago, and Iove it. It is a vey powerful and effective machine. The only issue I really have with it is cleaning the blades. I highly suggest that put the blades in the dishwasher instead of hand washing them. They are very hard to clean after you use them, especially when you are grating cheese in the machine. Other than that, the machine works great, even after 5 years of use out of it. I have used my food processor to makes sauces, bread and pizza dough, cookie dough, and chopping vegetables. It saves me a lot of time when I have to make sauces, and also when I need to cut up lots of vegetables. It is very easy to use and would highly recommend it to those that are beginner and expert cooks. Ease of Cleaning I am simply giving this a 9 because you really need to use the dishwasher to clean the blades really well. Hand washing the blades does not get them clean. Let me just start off with, I absolutely adore my Cuisinart 14-cup food processor. I love how versatile it is. I can make hummus, dips, even homemade peanut butter! I use this machine almost every day to create something new for my family to enjoy. 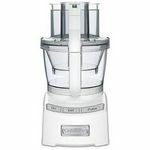 I recommend this for anyone who is in search of a reliable food processor that will do the job right every single time. Power This machine is very powerful. It gets tasks done in half the time that it would take the average food processor to do. Safety This food processor is actually very safe. I say "actually" because most of the food processors on the market are not. This machine is actually unable to even be turned on unless the lid is locked on tight and the components are connected correctly. The blades are not extremely sharp either. Ease of Assembly Very easy to assemble if you follow the instructions. Ease of Cleaning You can either hand-wash this machine or throw it in the dishwasher. I normally just hand-wash it with a bit of soap and warm water. Durability I purchased this food processor about two years ago, and I have used it weekly ever since. No problems with it whatsoever. Very heavy and sturdy. 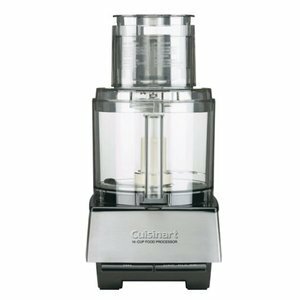 One of my favorite kitchen brands, Cuisinart has done it again! At the risk of sounding corny, I am so thrilled with how well this thing works. It is 14 cups which I LOVE since I can make one big batch of something instead of making multiple small batches of cole slaw or salsa, etc. size does matter in the kitchen. It will chop through anything. I have used it to make ice super small to make "slushies" on a hot day for the kids or chop up a ton of fruits and veggies for whatever kitchen creation I am making. The blades are incredibly sharp and fast so if something only needs a coarse chop use the pulse feature otherwise it may emulsify your food past what you want. Be careful when you are washing it. It is easy to take apart and set up but after food touches the blades they get slippery and you might cut yourself - unplug the processor before EVER sticking your hand in it and use kitchen gloves. The ONLY thing I have a little trouble with is garlic. If you don't want the garlic to stick to the sides and not get processed the right way, I always put a little olive oil on the sides, it will help the garlic slide down and go to the middle. Garlic is a problem in most food processors however, because this one is so big it seems more prevalent. The olive oil should do the trick though. Happy Cooking! Power This works amazing. Chops everything up fast. I would recommend pulsing if you only need items coarse chopped because it does work very quick. It makes fantastic pesto. My previous food processor was not strong enough to make pesto, it couldn't chop the nuts and get through the herbs. It wasn't fast enough. My Cuisinart is fast enough so the herbs don't cake up on the blades and will chop through the nuts fast and easy. Pesto takes about 2 minutes to make and because of the large size I can make a ton of it. I have never had to worry about over loading the processor, it just powers through everything. Safety As I stated, be careful of the blades. They are very sharp! If you are accident probe wear kitchen gloves. You should be able to just pull on the attachment that the blades are on and it will come off unless food gets stuck, then it might be tricky. Also monitor small children that go near this while it is on, or plugged in. There is no magic sensor that will make it stop if there is a stray hand in there. Ease of Assembly This is super simple to put together. I didn't need directions to know how to put it together. It is literally a ten second process if that. Ease of Cleaning This can be difficult to clean if you are not careful. I have cut myself a few times on the blades. Make sure to remove them before cleaning. I knew to do this but occasionally food will get stuck making it hard to get the blades off. If this happens soak it for a bit or run it with water in it to loosen anything stuck in there preventing the blades from coming off smoothly. Durability Cuisinart is a well recognized brand and I don't think they have have earned that reputation with sub par items. This is a powerful and durable machine. I have had mine for about six years now and my grandmother has had hers for a very long time. They still work like they are new. My grandmother and I sharpen our own kitchen tools but you may need to order new blades for this after a few years if it is used very often. Whenever I can, I try to cook healthy, and it seems that every type of healthy recipe requires you to use a food processor. 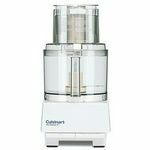 Over the years, I have used a few different food processors, and one that I really liked was the Cuisinart Custom Fourteen Cup Food Processor. This does a great job of cutting up pretty much any food I have put in it. The blades are really sharp, so they pretty much cut through anything. The food processor looks really nice, but I keep it in a lower cabinet in my kitchen. Since it takes up so much space, it's a little annoying to take in and out, but I don't really have counter space to leave it out. Safety I like that this won't turn on until you have all of the pieces locked into place correctly. Ease of Assembly This is a little difficult to put together, and it always takes me a little bit of time to remember which piece goes where. Ease of Cleaning This is really easy to clean because I just put the pieces in the dishwasher. This product is amazing for people who love to make their own sauces, breads, and even just to slice up vegetables. This was definitely a great buy! Power I was amazed at how fast the blades spin. I really thought that because the machine uses so much power to work that it would be loud, be it is rather on the quiet side. It is able to chop up food that my blender couldn't even process. Safety It is good safety wise. The blades will only spin if everything is locked into place. Those blades are beyond super shape though, so getting them into the base is the only thing I get worried about. Ease of Assembly Pretty simple and the booklet it comes with explains things pretty clear. It can be a little bit of a pain to lock in the pieces correctly but it is the easiest one I've used so far. Ease of Cleaning I hate washing dishes more then anything else, so I might be a tad biased with this one. I get super nervous about cleaning off the blades. It is not so bad to clean out, it's just that sometimes when I'm making sauces with it, the sauce flies up into the top chamber and then I have to wash that too. Durability Works great, even on things that I thought it wouldn't be able to puree or chop up. I absolutely LOVE my Cuisinart Food Processor. I may smooth and creamy hummus, nut butters, and delicious soups every week. I could NOT imagine life without my food processor!!! 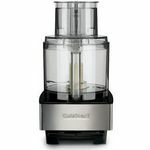 Power My Cuisinart gets the job done quicker than your regular household blender! It comes with a booklet with great recipes and care instructions to help your Cuisinart last for a lifetime! I love making pizza dough and pie crusts in SECONDS with this machine! Safety Excellent safety! There is NO way to turn on your processor if the lid is not locked on securely! No crazy mess to clean after 'accidently' pressing the on switch like with your regular household blender. Also, If you have young kids they cannot operate it without all the attachments tightened correctly. I LOVE this feature!!! Ease of Assembly The food processor will not work unless you've assembled it correctly. I love this feature. I have to store my Cuisinart in a cabinet over head and I find that the base is a bit heavy, but really no complaints. Ease of Cleaning I prefer hand washing my Cuisinart. The dish washer lodges food into the top section and I haven't been able to remove it, so hand washing is best. I Durability I've had my Cuisinart for about 3 years now and I've never had a single problem with it. As long as you assemble it correctly, you're in business! :) I wouldn't recommend making nut milks in it. They tend to leak out of the sides. There is a liquid level that they prefer you not go over and as long as you follow this you'll make great things. 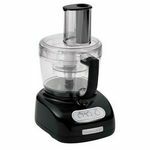 This food processor is great for all types of foods and dishes. It's easy to put together, use, and clean. From dicing, slicing, pureeing, and chopping, it works for every meal out there. I've had it for over 13 years and I never run out of things to use it for.